Rachel Nash has just moved to a beautiful new housing development. She should be happy, but she's notespecially when terrible things start happening there. What deadly secrets lie beneath the ground? Dominic Rossi has always loved the ancient tree that grows in the field behind his house. When his high school principal leads the charge to cut it down, Dom vows to save it. Then he starts hearing voicesand the tree's enemies begin to fall. Whoor whatis attacking them? David Reed falls for Luna Skinner, the new girl in town. Luna likes David, but won't let him near Scorpion Ranch, where she lives with a whole pack of relatives. Will Luna's family secret lead to David's demise? 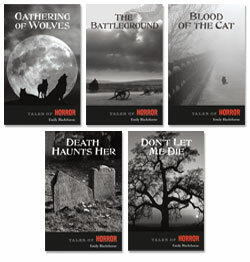 Special Offer: Tales of Horror and Hauntings are now available as a combined set with a discounted price. See Components below.